Would you just look at all the goodies?!? 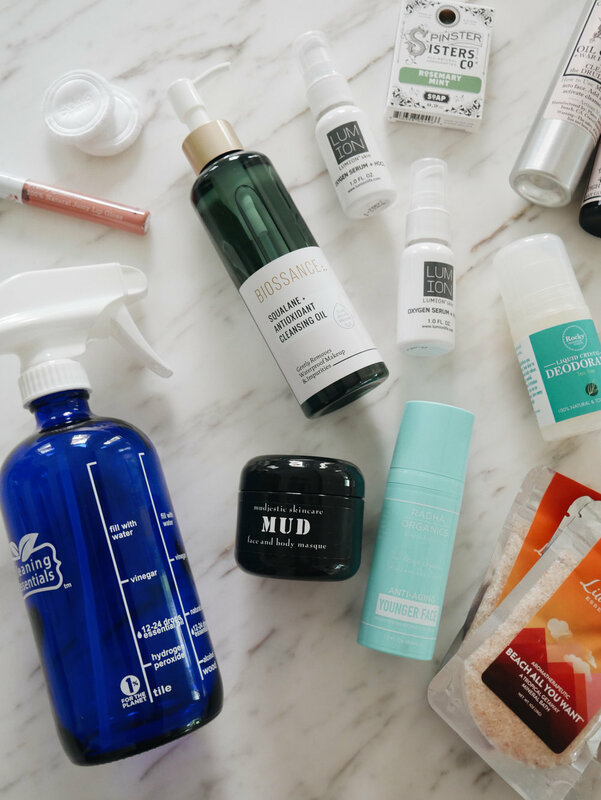 You all know that I love a good, clean beauty box! This one is no exception! With the Think Dirty June Limited Edition Beauty Box, you receive so many full-size products. They were all new to me – except the 100% Pure Lip Gloss! The box is at least a $250 value and you get to try so many products, from a company that you can trust! Do you know about Think Dirty? Think Dirty is a must-have resource for clean beauty lovers. It is a free app that you download on your phone to help guide you through product purchasing decisions. They have a very stringent rating system to help you gauge the toxicity in the products you are looking to purchase, as well as the ones you already own! You can even scan your products to see how they rate! It’s a genius tool for the clean conscious beauty lover! My absolute favorite product from the box is the Biossance Squalane + Antioxidant Cleansing Oil. You all know by now that I LOVE cleansing oils and this one is no exception! It is so good and I am obsessed with the packaging!! I also love The Original Cleaning Essentials Bottle! Printed on the bottle are 5 recipes for DIY cleaning solutions for Kitchen, Bathroom, Glass, Tile & Wood Cleaners. It’s incredibly handy and they thought of everything – from different spray settings to colored glass to protect your essential oils. This is such a great product! As always, I am happy to receive anything from 100% Pure! I received TWO of their lip glosses in a gorgeous, neutral shade. These are sure to become a staple for me! For a full breakdown of what comes in the box..and to order yours…check it out here! This box is a great way to try tons of new Clean products from a trusted source! I highly recommend it!